For the last two months, I have been digging in the architectural history of my home-town Dordrecht, and the more I read, the more respect I get for mr. Reus. He is one of the major architects that worked in Dordrecht during the Art Nouveau period, and many of the buildings that I am now getting to know, are by his hand. Hendrik Adrianus Reus came from a family of architects, so it was not surprising that he decided to choose an education in the same direction. At the Rotterdam Academy he became one of the better students. He graduated in 1894 with Professor Henri Evers, after which he moved to Amsterdam. Not for long though, as he returned to Dordrecht after three years to get settled. We know very little about his years in Amsterdam except for the fact that he became impressed by the works of the prominent Dutch architect H.P. Berlage. Berlages variation on Art Nouveau has later become known as Rationalism, a movement that valued the functional layout of the building, while on the outside the bearing character of the walls, arches and pillars was emphasized. 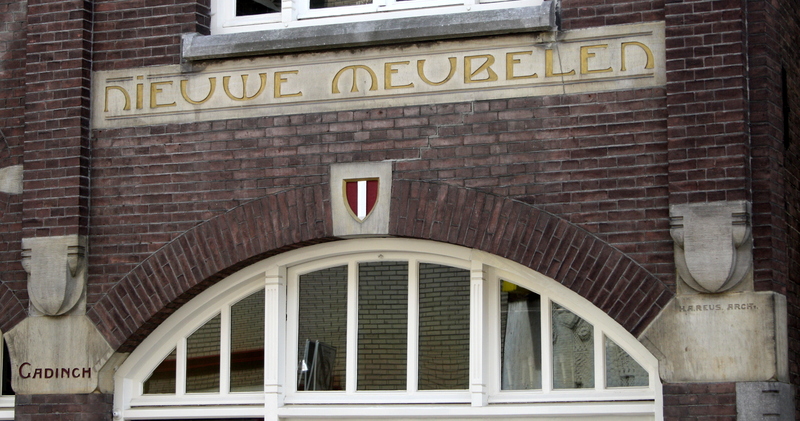 Berlages influence can be recognised in some of the first buildings Reus designed for Dordrecht, while he still lived in Amsterdam. 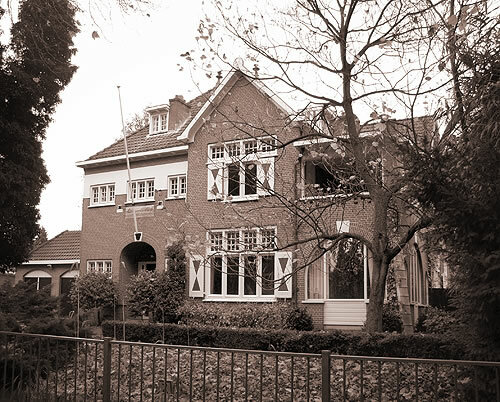 One of his first works (a detached block of ten houses on Toulonselaan, Dordrecht) he designed together with his father, J. N. Reus. That was in 1896. 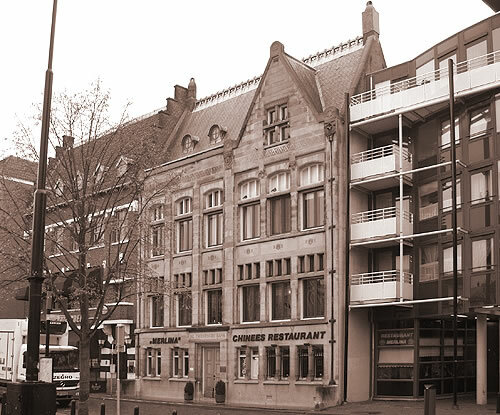 They also worked together in 1895 on an office at Groenmarkt for a solicitor, W.H. 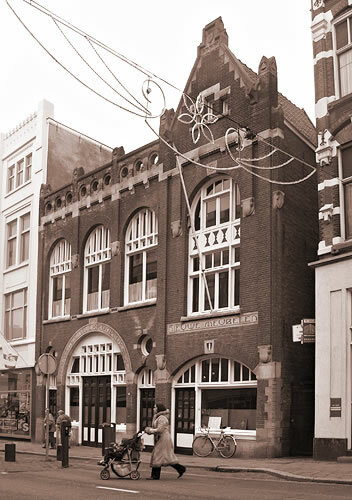 van Bilderbeek, followed one year later by an office at Wijnstraat for fire insurance company Holland and a shop-front at Voorstraat 380 for coffee and tea trader A. Dronkert. In the years that followed, he worked on his projects alone. Reus became very important for the architectural history of Dordrecht, as he was the first architect moving away from the tradition to design according to previous styles. He actually started to develop his own style. 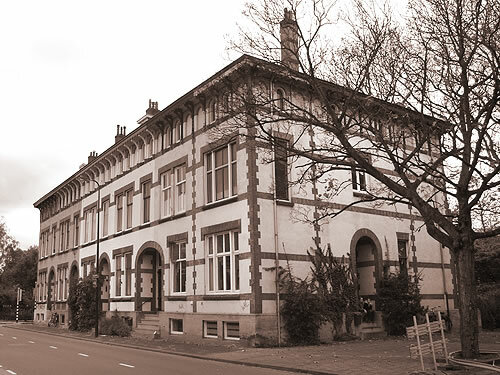 Until 1917, the year that Reus decided to enter into a partnership with B. van Bilderbeek (1876-1956), he designed numerous buildings in Dordrecht. 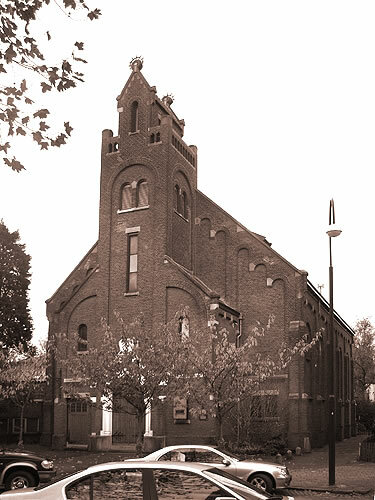 Some examples are the Twentsche Bank (1904) on Scheffersplein, Villa Merwehoeve (1908) on Vrieseweg, Auction house Mak (1901) on Visstraat and the Remonstrantse Kerk (church, 1901) on Cornelis de Witt Street. 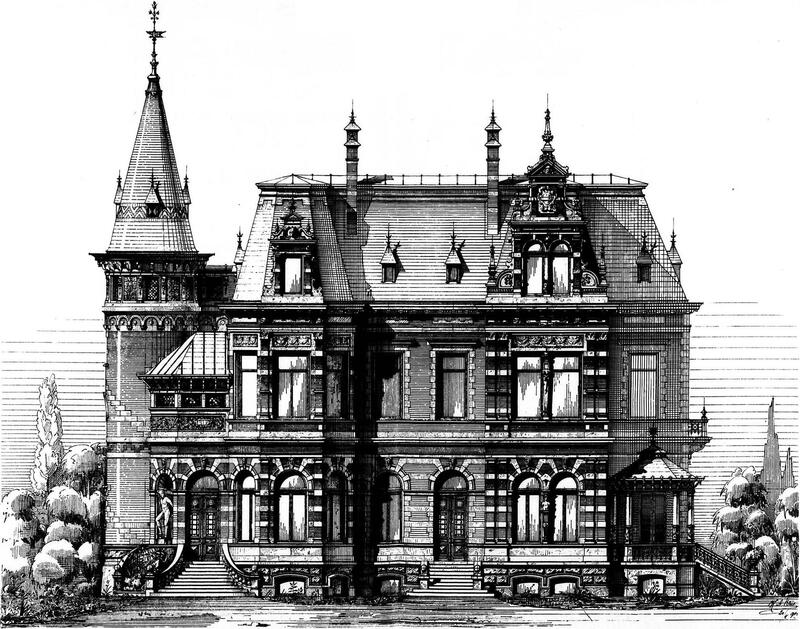 Together with Van Bilderbeek, he worked on numerous larger projects such as factories, schools, residential quarters etc. These buildings did not strike me as pure Art Nouveau buildings at first sight (because of the lack of whiplashes, long stemmed flowers and slender female figures), but they do actually have a lot of characteristics of the Art Nouveau style, once you learn to recognise those characteristics. On Open Monuments Day, I visited the Remonstrantse Kerk (above church) and the interior is beautifully decorated in Art Nouveau style! Once I have all details on that church cleared, I will share the pictures I took and I will write about the other objects too. 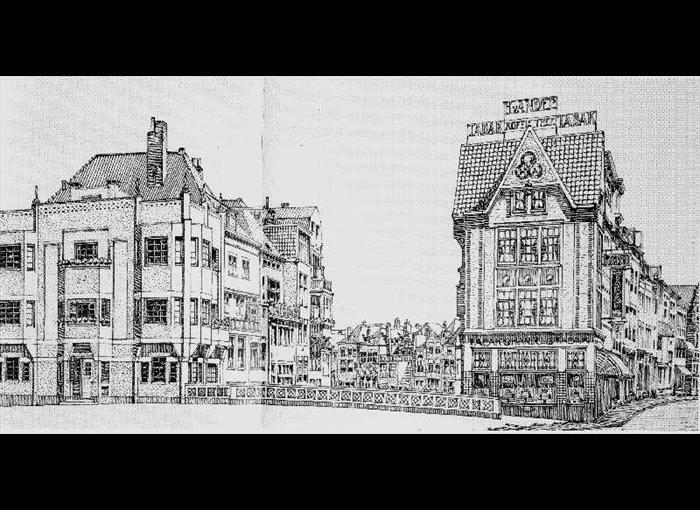 And what about this drawing, in which Reus is showing us his proposal for the building on the left; it was never built. To me, it resembles the Austrian Art Nouveau style: Viennese Secession. The design reminds me of the Stoclet Palace by a German architect named Josef Hoffmann. And it also reminds me of some American designs by for instance Frank Lloyd Wright. Outside Dordrecht Reus made his reputation in the field of restorations. Both the towers of Woudrichem and Kruiningen, and the church in Waalwijk have been restored under his leadership. It was on the recommendation of the National Institute for Preservation of Monuments that he was commissioned for these projects. 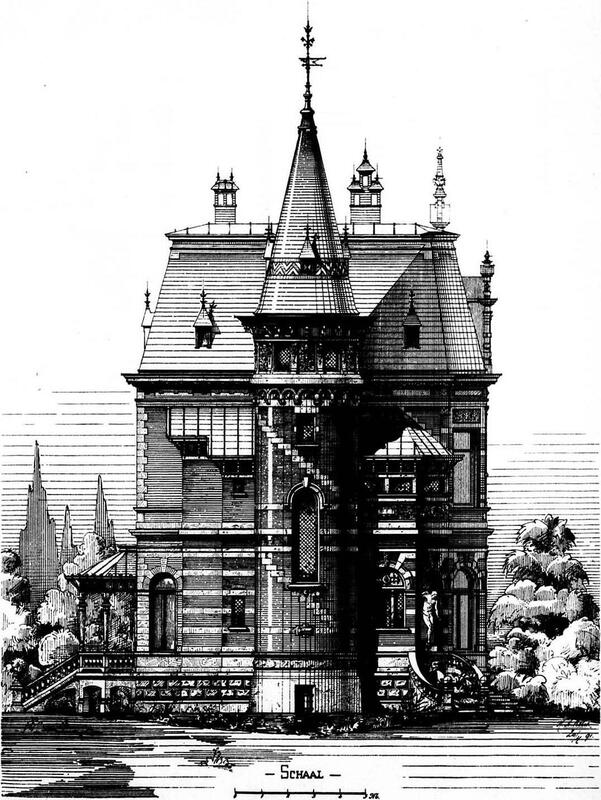 “Especially these restoration works, that demanded much self-control and self-denial of the architect, proved Reus’ technical ability, sensitive craftsmanship and his complete dedication to an accepted order.” Recalled the Dordrecht Newspaper the day after the death of architect Reus on 24 October 1935. Besides his work Reus devoted himself to painting. He was co-founder of the Dordtsche Kunstkring (Art Society) in 1899, and director of the Dordrecht Museum, Museum Old Dordrecht (now Museum van Gijn) and Teekengenootschap (Sketch Society) Pictura. Now, for the people who would love to see some examples of the work of mr. Reus, I have a surprise! Browsing the internet I found a map of Dordrecht, marked with several objects designed by Reus: Reus Tour Dordrecht.